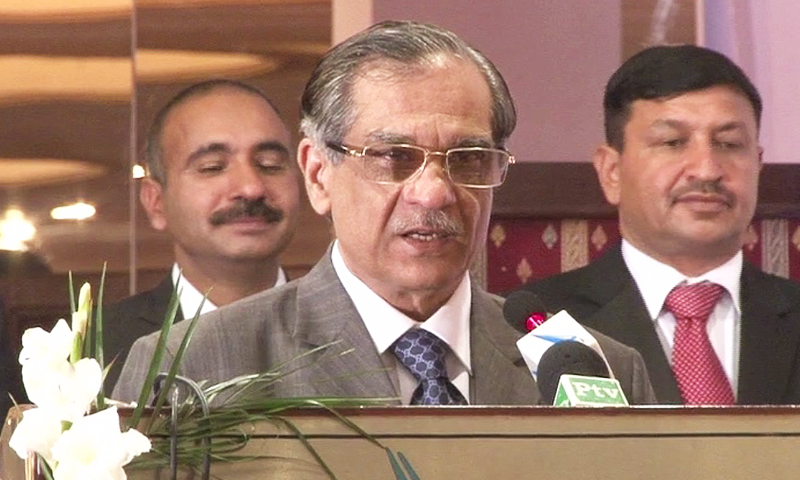 Chief Justice of Pakistan (CJP) Mian Saqib Nisar on Saturday hit out at the people criticising the judiciary for issuing judgements that they deemed “unfavourable”. Addressing a seminar in Lahore, Justice Nisar said the perception that the judiciary has become a part of a bigger plan or design needs to end. Referring to the judiciary using the analogy of a baba (village elder), he said: “The judiciary is your baba […] do not doubt its integrity,” he said. The chief justice said those against whom a judgement has been issued have the right to criticise the reason behind the verdict, but he questioned the insinuations of the judiciary being part of a plan” or “being under pressure”. He said that no one dictated the court on what line to take in deciding a case. He added that the judiciary and lawyers will have to make joint efforts to provide cheap justice to the common man.